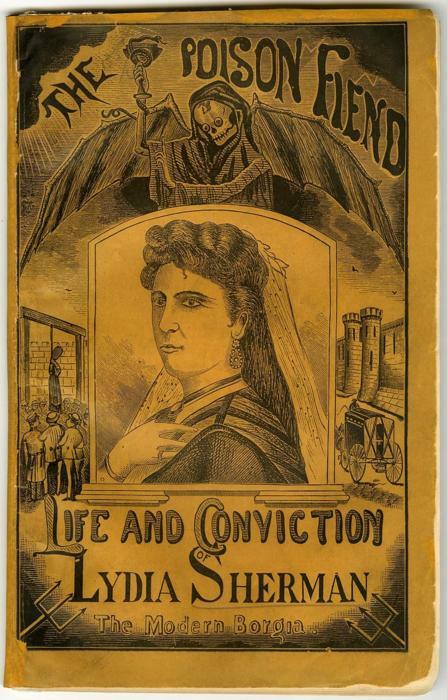 Known as America’s “Queen Poisoner”, Lydia Sherman was born in 1825 as Lydia Danbury in New Brunswick, New Jersey, and became one of the greediest poisoners in American criminal history. In 1845, she married Edward Struck, a policeman, by whom she had six children. He was sacked from the New York Police Department for cowardice — he refused to break up a fight — and took to drinking and self-pity. He began to beat her up when he was drunk and she retaliated by putting arsenic in his soup. She insured her husband for $5,000 and then visited a chemist where she bought poison to kill rats. With her husband out of the way (he died on 26 May 1864, supposedly from alcoholism), she then insured the lives of her six children, aged from nine months to 18 years, before poisoning them as well. The local township expressed its deep sympathy at such a tragedy and no one suspected the widow and mother was anything other than grieving. On 22 November 1868 she married Dennis Hurlbrut, a wealthy, elderly and, some said, senile farmer from New Haven, Connecticut. He promised to leave her all his money in his will. He died 14 months later and by 1870 she had spent all of his estate. In April 1870 she became housekeeper to Nelson Horatio Sherman, a rich widower and father of two who lived in Derby, Connecticut. The housekeeper eventually became the wife and showed her gratitude by poisoning first his baby son, Frank, and then his 14-year-old daughter, Addie. Lydia gave her husband poisoned hot chocolate and Nelson Sherman died on 12 May 1871. It was at this time that someone finally noticed. The local medic, Dr Beardsley, became suspicious and, after finding arsenic in Nelson Sherman’s stomach, called for a second opinion and then a third. Realising the jig was up, Lydia Sherman fled to New York. Dr Beardsley informed the police of his suspicions. The police in Connecticut ordered Lydia’s extradition and she went on trial. Convicted of second-degree murder, she was sentenced to life in prison. In January 1873 she confessed to seven murders and said her victims were “better off dead”. She died of cancer on 16 May 1878, incarcerated in Wethersfield Prison.